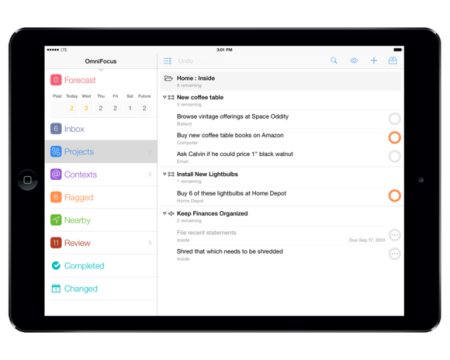 Spoiler Alert: OmniFocus 2 for iPad isn’t for everyone. If all you need to keep track of is a grocery list and a few one-off tasks each day, OmniFocus isn’t really the task manager you are looking for. On the other hand, if you juggle multiple areas of responsibility, and frequently need to break down large projects into more manageable steps, OmniFocus will keep your life organized, and turn you into a productive, task-obliterating machine. OmniFocus 2 for iPad represents the last piece of the OmniFocus pie being updated to version 2, bringing the app in line with OmniFocus 2 for Mac and iPhone. Yes, that means that to use OmniFocus across all your devices, you’ll have to spring for up to three different paid applications. But again, OmniFocus is industrial strength task management, and the iPad version is well-designed and worth it to anyone who has already jumped on the OmniFocus train.